When Art Laboe of the Original Sound label contacted Paul Buff about recording some surf tracks with bongos in the spring of 1963, Buff got together with guitarist Dave Aerni and became The Bongo Teens. 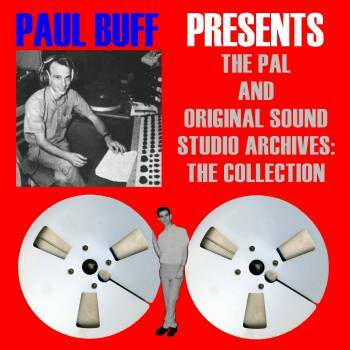 Other than guitar, Paul Buff played and recorded everything else himself. Laboe's idea was to combine three tracks from Preston Epps (of "Bongo Rock" fame) with whatever Paul Buff could come up with. Including Preston Epps' #14 hit "Bongo Rock" and his #78 hit "Bongo Bongo Bongo," "Surfin' Bongos" was completed that summer and was originally issued by Original Sound in September 1963. March 2010 saw the first official reissue of that album from the original mono and stereo album masters, along with many rarities and unreleased tracks drawn from master tapes and acetates. 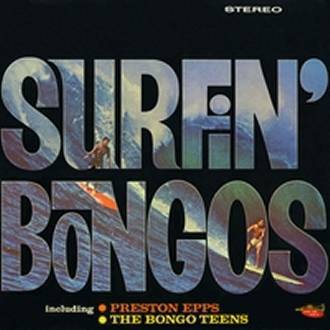 In addition, The Bongo Teens' version of "Bustin' Surfboards" (originally by The Tornadoes) was featured in the film "Aloha Summer." The 2010 edition was a download only release and was available in separate MONO and STEREO editions with the same bonus tracks. As part of the bonus rarities of the 2010 re-release, both sides of The Rotations' single ("Heavies"/ "The Cruncher") and the Brian Lord & The Midnighters single ("The Big Surfer"/ "Not Another One!") were included along with extremely rare tracks ("Baja Rhythm" and "La Gran Ola") that were only released in Mexico. "The Big Surfer" was written by Frank Zappa, who played guitar and portrayed a surfer on the track. Together with the "Surfin' Bongos" re-release, Crossfire Publications also released "Raw Tracks", presenting the raw recordings from before the reverb, equalization and final mastering were added. "Recorded shortly afterward, The Bongo Teens’ “Last Night” was a strong cover of The Mar-Keys’ classic. Paul Buff and Dave Aerni’s recordings as The Bongo Teens are also available as separate mono and stereo releases of the “Surfin’ Bongos” album as well as on the “Raw Tracks” album with The Hollywood Persuaders." "Finishing out this volume is an acetate from The Bongo Teens – “Another Wipe Out.” Clearly inspired by The Surfaris’ “Wipe Out,” this is Paul Buff and Dave Aerni’s interpretation of a similar theme. The original acetates sounded like they were done in a tunnel, but we have presented the track with the best possible sound from such a fragile disc. You should have heard it before!" "More surf is on the way! The Bongo Teens' "Surfin' Bongos" was Paul Buff, Dave Aerni and a long-forgotten bongo player, and note the sped-up guitar parts!" "Also unusual is The Bongo Teens' version of "La Gran Ola," which is what "Heavies" was called when it was released in Mexico! The title translates to "The Big Wave," but there are no sound effects on the Mexican version." "We're still riding a wave here, so let's hit the next five surf tracks. Frank Zappa was behind the board when The Tornadoes recorded (James) Norman Sanders' "The Inebriated Surfer," the B-side of their single "Moon Dawg." This single mix is different than the later album mix. The Truants' "Sunset Surf" is a very sedate piece, with Edward Rea's guitar going into Duane Eddy territory. If you listen closely, you can hear where Rea changes guitar effects during the song! The Rotations' "The Cruncher" was the B-side of "Heavies" and another respected surf work. Of course, The Rotations was another name that Paul Buff and Dave Aerni used when they were not recording as The Bongo Teens, so we have a stereo mix of "Baja Bongos" that was not originally released. Our last surf track in this run is The Esquires' "What A Burn," done at the same session as their A-side "Flashing Red"." "On this edition, you can also hear The Bongo Teens' "Surfin' Bongos" before the bongo player came in!" "The Bongo Teens' "Baja Rhythm" was another tune that was only released in Mexico. Paul Buff and Dave Aerni covered different ground on this one." "It's time to "Wipe Out"! Yes, it's The Bongo Teens' version that appeared on the "Surfin' Bongos" album that they shared with Preston Epps. That album has been reissued in mono and stereo." ""Blue Skies" by Irving Berlin was done in a pre-surf version by The Biscaines in late 1960. In mid-1963, it was now The Bongo Teens' turn to attack it in full surf style." "Buff and Aerni initially recorded "The Happy Surfer" without their hired bongo player, so here is a rare opportunity to hear it in its "naked" form. Buff's second version of "You Will Never Have To Dream" along with "Donnica" didn't go any further, but it's interesting to hear different ideas that Paul was playing with." "The Zappa-engineered "Raw-Hide" by The Tornadoes is a compact but powerful take of the Link Wray tune, with The Bongo Teens' instrumental version of "Surfin' U.S.A." accomplishing the same task." "The first of two Tornadoes-related songs is The Bongo Teens' version of the classic "Bustin' Surfboards." Despite being a three-chord song, "Bustin' Surfboards" remains a perennial favorite. The Bongo Teens' version was used in the 1988 film "Aloha Summer." A slightly longer version of "Bustin' Surfboards" appears on the "Raw Tracks" album. Following that, The Tornadoes themselves offer the Frank Zappa-engineered "Shootin' Beavers." When it was released in late 1963, parents were outraged that their children were listening to such a "lewd" song! While the title may have been in bad taste, the song was practically instrumental with the occasional side comment!" "The Bongo Teens' "The Happy Surfer" is the original stereo mix and is just as the title describes! " 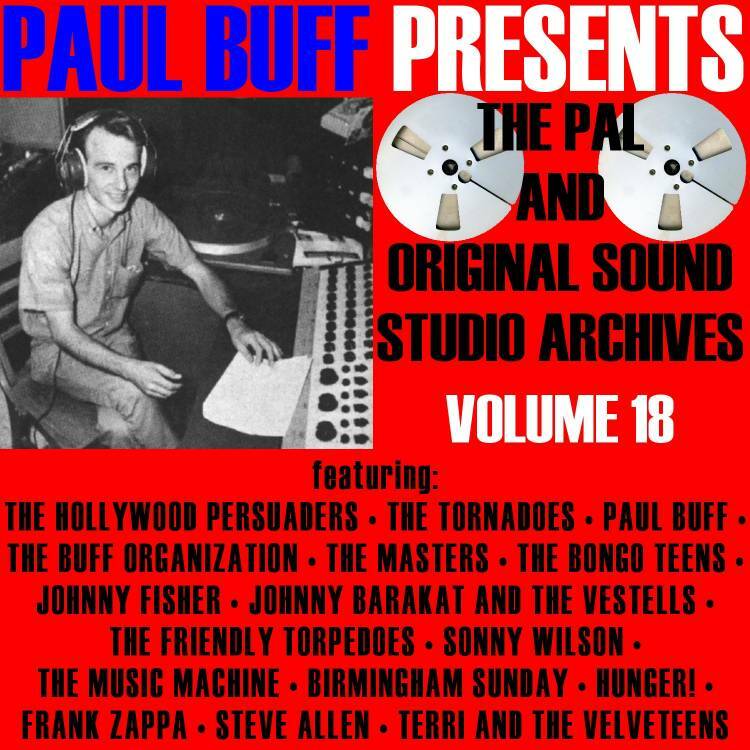 "The Bongo Teens' "Forget It" was a Buff/Aerni piece that Paul Buff got more mileage from when it was remixed for the Hollywood Persuaders album "Drums A-Go-Go." 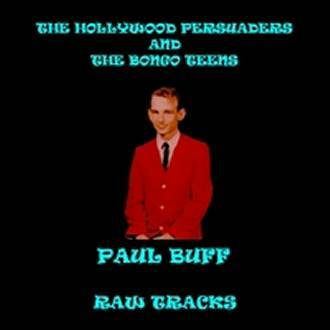 A considerably longer Bongo Teens version of "Forget It" is available on "Raw Tracks.""